To make the sauce, sweat leek slices and onions till translucent and soft. Reduce white wine and lemon juice. Add in light cream and simmer for 10 minutes. Remove from heat and purée. Sieve, and season to taste. For Beurre Noisette, melt butter on medium heat till small specks (milk solids) start to turn a golden brown and release a nutty, caramel aroma. Remove from heat. Slice ginger into extremely flat thin sheets. Rinse in tap water. Pat ginger strips dry on a cloth. Deep fry till golden brown. Drain on oil absorbent paper. Peel parsnip lengthwise to get long strips. Toss in olive oil and butter, and bake at 180°C for 10 minutes until edges brown slightly. 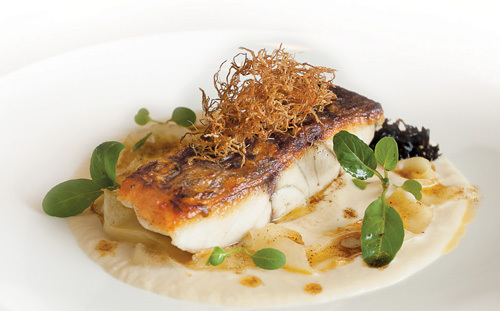 Season both sides of the barramundi with smoked salt and ground black pepper. Pan-sear the barramundi skin down on medium high heat in a non-stick pan, olive oil and butter till it crisps up. When the flesh turns to opaque halfway, flip the fish and sear the flesh side till completely cooked. 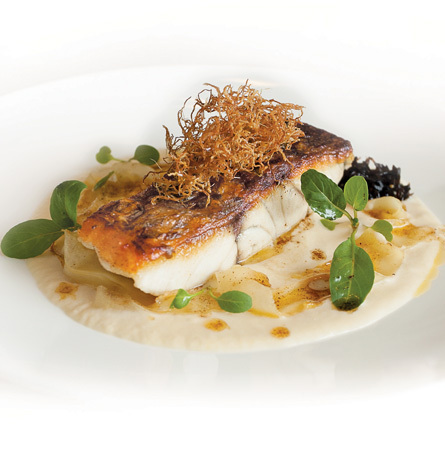 To serve, lay some sauce, then place the fish skin side up, lay the strips of parsnip around it. Top with crispy ginger. Scatter the arugula, drizzle with beuree noisette and extra virgin olive oil and place a mound of Ship Kombu.